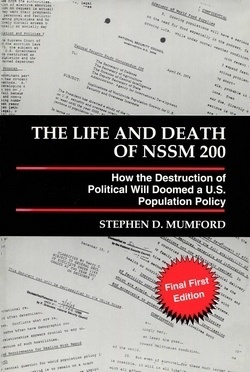 Adapted from chapter 11 of our chairman Dr. Stephen D. Mumford’s seminal book, The Life and Death of NSSM 200: How the Destruction of Political Will Doomed a U.S. Population Policy (1996). The book is available at Kindle here, and is available to read for free here. Infallibility made Roman Catholicism even more attractive to many. People often seek religion because of their fear of uncertainty and the unknown in their lives and in death. It provides emotional relief. According to Catholic theologian Hans Küng, “Infallibility performed the function of a metadogma, shielding and insuring all the other dogmas (and the innumerable doctrines and practices bound up in them). With infallibility—and the infallible aura of the ‘ordinary,’ day-today magisterium is often more important than the relatively rare infallible definitions—the faithful seemed to have been given a superhuman protection and security, which made them forget all fear of human uncertainty…. In this sense the dogma of infallibility has undoubtedly integrated the lives of believers and unburdened their minds …” So now the Church offers a final, unsurpassable guarantee of security to believers. This is a powerful attraction to all who fear insecurity—which includes most of us. Infallibility provided many believers with a great sense of religious security all through life, imparting stability and freedom from anxiety, relieving emotional pressure and softening the cruel blows of reality. The Church still derives enormous power from the claim of infallibility. “Paul VI laid aside his tiara” writes Hasler. “Both his successors, John Paul I and John Paul II, dispensed with the throne and crown. But the pope’s claim to infallibility has remained, and hence so has their position of power. For power was the issue in 1870 …” But, if the essential foundation of the Church laid by the dogma of infallibility is destroyed, faith collapses and the whole Church will crumble. For this reason, it is imperative to the Vatican that this dogma be protected. [I]n the Middle Ages there was a conspicuous trend to look for an infallible authority, whether it be pope or council, to buttress the great edifice of the Catholic system. Its original religious power had been lost, and yet the entire social structure still rested on religion as much as ever. Behind the perfectly intact facade doubts and uncertainty began to spread. Signs of disintegration became apparent in philosophy and theology. The old spontaneity and unquestioning naturalness of the faith were largely gone. The quest for infallibility looks like a desperate attempt to recover a lost sense of security. The endeavor to shore up doctrinal structures was unusually momentous because religion still played such a unique part in most people’s lives. Their personal happiness depended on it, first of all in this world, and still more in the next. The great majority of the population had neither the skill nor the desire to judge questions of faith: They wanted to rely on authorized teachers. This only heightened the power and influence of the religious elite, which held the fate of so many in its hand. This arrangement thoroughly suited the mutual interest of both groups. Only those who could offer certainty in matters of salvation would be of any use to the people of that time. And so it didn’t sound like blasphemy when men of the Church appeared, claiming they had been given all power in heaven as well as on earth (Boniface VIII). According to Hasler, “The plan was to enhance the pope’s authority as much as possible, not only in hopes of strengthening the old hierarchical order within the Church but, above all, in society at large.” This objective was largely achieved, especially in the United States, as bishops and lay Catholics marched in lock-step until 1968 when the encyclical Humanae Vitae was issued. During the period 1870 to 1968, the American press was almost completely tamed. The Knights of Columbus, the largest organization of Catholic laity in the world, was founded soon after the dogma of infallibility was adopted (1882) by a priest in New Haven, Connecticut. The mission: protect the faith. By 1914, the Knights had evolved into a national organization with considerable capability to intimidate those who spoke out against the Church regardless of whether the criticisms were justified. They created the Commission on Religious Prejudices, chaired by Patrick Henry Callahan, to shut down the press criticism of the Church. According to their 1915 report, the Commission sponsored an education campaign by “informing and correcting editors and journalists who allowed religious prejudices to surface in their newspapers.” Callahan pointed out that between August 1914 and January 1917, the number of publications which published material critical of the Church dropped nationwide from 60 to two or three. Until this time, the American press was free to be critical of the pope, the Vatican and the bishops, who are undeniably agents of a foreign-controlled power. But since the days of Callahan’s Commission, the American press has not been free to report on the considerable political activities, and, most important, the motivations behind those activities. As a result, few Americans are aware of just how much their access to information is restricted by the Church. The free presses of Europe and North America were gravely undermining papal authority. The proponents of the doctrine of papal infallibility were convinced that this doctrine would lead to control of the world press on matters vital to papal authority. The control of individuals in the press, as well as individuals who could be used to manipulate the press in various ways, including intimidation, in order to protect papal authority, was a key argument for adoption. The proponents were correct on this account as we shall see in Chapters 13 and 14. Absolute control of the entire Church structure by a despotic pope was made much easier by this dogma. The majority rule on questions of dogma that had existed for nearly 2000 years ended the day infallibility officially became dogma. The Jesuits were the chief manipulators in the campaign for papal infallibility. Apparently, the Jesuits felt that their never ending political agenda would be best served if the pope became an infallible despot. The Jesuits were chosen to write the official history of Vatican Council I some 20 years later. More than anything else, even the manipulation of the bishops by the Jesuits, it was the fear of schism, that was considered a worse misfortune than infallibility, that kept the bishops in line. A schism did occur but unfortunately for America and the rest of humanity it was small, resulting in the creation of what is known today as the Old Catholic Church. The Swiss theologian Hans Urs von Baltha called the Vatican dogma a “gigantic disaster.” One bishop described the pope as “an authority subject to no other control than his own whims and preferences. The new dogma, he felt, must lead to despotism.” Wrote Henri Icard, a priest, “This is truly a difficult situation for the Church. The most absolute power—in the hands of a man who will only listen to the people who think—or, rather, speak—the way he does.” The French bishops, in a minority petition, wrote, “The new dogma, which must lead to such grave consequences, is demanded of a Council which is both deeply divided and not free.” Different bishops referred to the new dogmas in the following way: “the Vatican farce,” “the pope is devouring us,” “we have to eat what we have vomited up,” “a crime against the Church and humanity.” Says Hasler, “For them [the Council minority], the credibility of the Church was on the line.” Professor Friedrich Michelis described Pius IX as a “heretic and devastator of the Church.” Neither his cardinal nor his bishop contradicted him. In German-speaking countries alone, twenty professors of theology and clerical teachers of philosophy were excommunicated within a short time after the Council. Two-thirds of all Catholic historians teaching at German universities left the Church. To affirm that the Council lacked the freedom necessary to validate its ordinances is impossible…. Under no circumstances would God abandon his Church in such a way that we should one day be justified in going back and questioning what the great majority of the bishops, together with the pope, decided on matters of faith! … Can we run the risk of such a scandal? And what would then become of the Holy Church? Objections to the adoption of the dogmas of papal primacy and infallibility were extensive, thoughtful and loud but to no avail. We can be certain that the Church, as an institution, will become extinct before these two dogmas are terminated. Dr. Stephen Mumford is the founder and President of the North Carolina-based Center for Research on Population and Security. He has his doctorate in Public Health. His principal research interest has been the relationship between world population growth and national and global security. He has been called to provide expert testimony before the U.S. Congress on the implications of world population growth. Dr. Mumford has decades of international experience in fertility research where he is widely published, and has addressed conferences worldwide on new contraceptive technologies and the stresses to the security of families, societies and nations that are created by continued uncontrolled population growth. Using church policy documents and writings of the Vatican elite, he has introduced research showing the hierarchy of the Roman Catholic Church as the principal power behind efforts to block the availability of contraceptive services worldwide. In addition to his books on biomedical and social aspects of family planning, as well as scientific articles in more than a score of journals, Dr. Mumford’s major works include American Democracy and the Vatican: Population Growth and National Security (Amherst, New York: Humanist Press, 1984), The Pope and the New Apocalypse: The Holy War Against Family Planning (Research Triangle Park, North Carolina: Center for Research on Population and Security, 1986), and The Life and Death of NSSM 200: How the Destruction of Political Will Doomed a U.S. Population Policy (Research Triangle Park, North Carolina: Center for Research on Population and Security, 1996). Professor Milton Siegel, who for 24 years was the Assistant Director-General of the World Health Organization, speaks to Dr. Stephen Mumford in 1992 to reveal that although there was a consensus that overpopulation was a grave public health threat and would be a major cause of preventable death not too far in the future, the Vatican successfully fought off the incorporation of family planning and birth control into official WHO policy. This video is available for public viewing for the first time. Read the full transcript of the interview here. 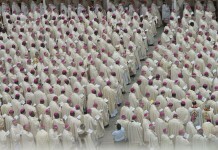 Why is the Catholic Church on a course of self-destruction?